While the Viking warrior loved to be offensive in battle, armour was important also, and the Viking warriors were well aware of the benefits of good armour. In battle freedom of movement was important, but mistakes are always made and the Viking warriors were happy to meet a balance of manoeuvrability and protection. The historical evidence of Viking armour is still a mysterious and fully unknown area, certain pieces of armour were almost certainly used, and evidence of them exists to this day. For example the Viking warrior helmets were a central piece of equipment and examples still survive today. Body armour for the Viking warrior is a more contentious issue with wooden carvings from the ancient Norse period definitely depicting some form of patterning on the torso, but no real evidence exists today. One think we are almost sure of, is that high ranking Vikings wore considerably better clothing an armour than the traditional Viking warrior. It is actually a common thought among historians and old Norse experts that many Viking warriors would have actually fought in normal clothing, with only a helmet and a shield as armour. One of the most important pieces of armour was of course the helmet, no Viking warrior would want to enter battle without their helmet, which offered them serious protection from blows to the head. The Viking helmet came in various forms, but all were constructed from iron, as the Vikings were of course excellent metalworkers. The common Viking helmet was simply a rounded or conical metal helmet, these helmets could have nose bridges, or even circular eye guards. The main protected offered from this type of iron helmet was against blade attacks to the head, or even blunt force attacks from melee weapons. 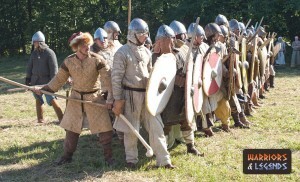 A band of Viking warriors sporting fabric, leather and metal armour. The shield was the most important part of any Viking warrior armour, and it actually offered not only protection from attacks, but could also be used as an offensive weapon too. The shield is actually a detailed subject and one that begs for a more thorough investigation, which we actually do in our specific article that covers the various types of shields the Viking used, their construction and implementation in a battle. As we mentioned before, armour for the Vikings was surely a trade off between retaining flexibility and range of motion, with defence and protection, and one of the most discussed portion of this lies in the body armour of the ancient Viking warriors. Many historians and experts believe the average Viking would have worn no body armour, or if they did, it would have been leather armour. Lightweight and flexible, leather vest would likely have provided the right balance to many Vikings. Mail armour has been found at some Scandinavian sites, dated to the latter end of the ancient Norse periods, but due to its complexity and weight, its thought that it was not common among the general population. The predominant theory is that if the Vikings were to have worn a form of mail armour, more examples would have been found. One thing we do know is that if mail armour was used by the old Viking warriors they were never buried with it. Maybe the mail was too rare to bury, and it was passed on to the son of the deceased warrior, or maybe it just wasn’t used. Unfortunately it seems like we will not likely ever discover the true answer to this question. The Viking warriors true to their nature were ferocious and offensive in nature, and their armour choices reflect this. Heavy armour was not favoured, with a helmet and shield often enough for most warriors. The Vikings had no desire to be slowed down or restricted by heavy armour, nor would most have the money to afford such luxuries.